A petition by Regavim led to the destruction of illegal Arab structures in the Tekoa region by the Civil Administration. The Civil Administration demolished Wednesday five tents and eight water reservoirs which were constructed without legal permits near the community of Tekoa in the Etzion Bloc (Gush Etzion) south of Jerusalem in response to a petition by the Regavim movement last November. The movement, which maintains strict surveillance of illegal Arab construction, welcomed the enforcement actions in the Tekoa region and explained that this is a particularly strategic area for the State of Israel. 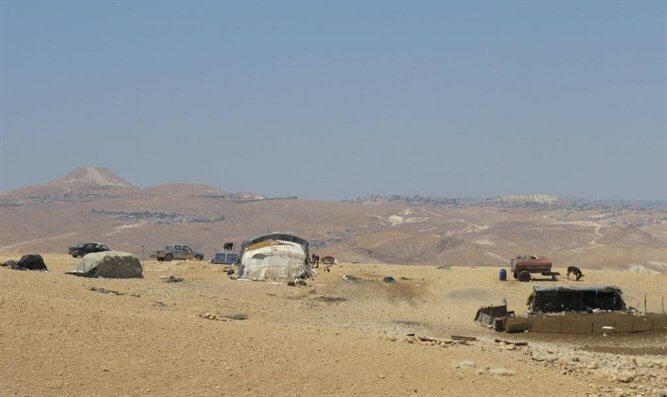 Over the past year the movement submitted two petitions to the High Court against illegal construction in the Tekoa region - one regarding an illegal road paved using international funding connecting the Arab villages near Tekoa to the Dead Sea. The road was intentionally paved by the Palestinian Authority in the only region where Israel could pave a connecting road between the Etzion Bloc and the Dead Sea. The second petition was submitted in November 2016 and referred to illegal construction near the aforementioned road with the intention of turning it into an inhabited area which could then de facto be transferred into the hands of the PA, although it is in Area C under Israeli jurisdiction. The Civil Administration was supposed to respond to the petition by 30/12/16 but did not submit its response in time. The Administration requested a deferment in submitting its response and on Wednesday destroyed the structures in the area so that at the beginning of next week it can present to the court pictures of the demolished structures and ask that the petition be dismissed based on the partial enforcement of the law. "It is clear from aerial photographs that this is a particularly strategic region for the State of Israel, which is why the PA is investing so much money and effort in strengthening its involvement in the region," said Oved Arad, director of the field department of Regavim. "The enforcement operation was good but the Civil Administration should not enforce the law only when the time frame of the High Court is pressuring it. We will continue to submit petitions until the Civil Administration initiates action of its own accord."